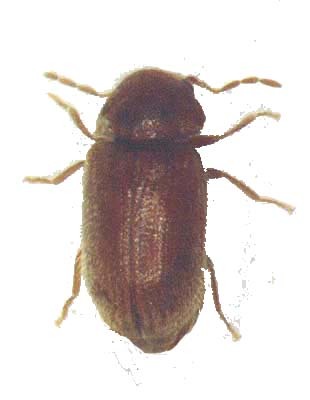 Sawtoothed Grain Beetle: Adults dark brown, about 1/10 inch long with a flat body enabling penetration of many “sealed” food packs without chewing holes. Adults and larvae crawl actively and eat flour, breakfast cereals, sugar, nuts, dried fruits, dried meats, etc. Infestations make food unpalatable. Confused and Red Flour Beetles: Adults reddish brown, about 1/8 inch long. 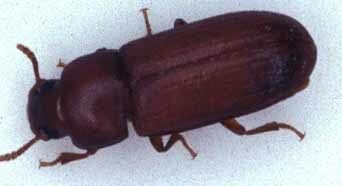 Red flour beetle can fly and is more common in South. Confused flour beetle does not fly and is more common in North. 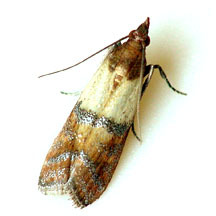 Common pests of flour but also eat cereals, beans, nuts, dried fruits, chocolate, and even spices. They are among the many pantry pests which secrete chemicals known as quinones which taint food and may harm people. Drugstore Beetle: Adults light brown, about 1/10 inch long and able to fly. Found throughout the U.S. , eating almost anything, including bread, flour, cereals, and even red pepper. Often brought into homes in bagged pet food but able to bore through most packaging and infest other food. Rice Weevil: Adults reddish brown, about 1/8 inch long and able to fly. Females bore holes in grain kernels (rice, corn, etc.) in field crops and food stores and lay a single egg in each kernel. Hatching larvae eat and develop within the kernel. Emerging adults also eat cereal grains, as well as beans, nuts, and even grapes. Mostly found in the South, where buildings can be invaded from nearby fields. Spider Beetles: Adults oval-shaped, brownish, 1/10 to 1/6 inch long, resembling small spiders but having 6 legs. Adults and larvae scavenge on animal and vegetable matter, including cereals, flour, bread, nuts, dried fruits, spices, feathers, fur and rodent droppings. They will even chew carpets, books and wood. Preferring damp locations and resistant to cold, they often infest unheated warehouses, basements and outbuildings, even in the North. Indian Meal Moth: Adults have 3/4 inch wingspan. Outer section of forewings reddish brown. The whitish larvae prefer dry foodstuffs, including corn meal, flour, nuts, dried fruit, powdered milk and bird seed. Larvae leave a mess of silk webbing and frass on food. One of the most common food pests throughout the U.S.
What You Can Do Against Pantry Pests? Pantry pests eat the same food as people, as well as many other organic materials that we don’t eat. Once they get into our homes they can thrive and it is important to understand how they might enter. Some pantry pests can live outdoors feeding on crops or scavenging in nests of wild birds and rodents. Such pests may actively enter nearby homes, particularly where entry is easy or where they are attracted by warmth, lighting or food odors. However, most pantry pests are passively introduced on infested merchandise. In both cases, homeowners can take steps to reduce pest entry. Also, by routinely following good food management and sanitation practices, the impact of any pantry pests which enter can be kept to a minimum. In fact, homeowners can probably do more to prevent and control pantry pests than any other group of pests. Nonetheless, it has been estimated that the average American unknowingly consumes 1 to 2 pounds of insects or insect fragments each year in food. This is equivalent to eating about 500,000 small, food-infesting beetles – so there is clearly scope for better pest management. Here are 10 measures you can carry out against pantry pests. 1. Check your food purchases for signs of infestation and return to the retailer any newly purchased “buggy” items. 2. Avoid purchasing food, particularly bagged or loose food, from stores which are unsanitary or which hold stocks too long or do no practice strict stock rotation. In particular, beware specialty stores where turnover of some pest-prone food items may be slow, making them more liable to become infested. 3. Avoid purchasing more food than you need. This is especially important for items which are sold in bulk and are very vulnerable to pest attack (e.g. flour, beans and dried fruits). 4. Keep food refrigerated or in clean tightly closed glass, metal or plastic containers. Dispose of original paper or cardboard packaging. 5. Regularly rotate your food stocks and dispose of any items which are out-of-condition or infested. 6. Discourage pests such as red flour beetles, cigarette beetles and larger beetles from entering from outdoors by screening or sealing possible entry points. 7. Regularly clean food storage areas (at least every 3 weeks), paying particular attention to less accessible places such as in corners and under cabinets where food spills and dirt might otherwise accumulate and encourage pests. 8. Seal cracks and crevices in and around food areas to prevent them collecting food particles and providing feeding or hiding places for insects. 9. Keep bagged pet food separate from human food and preferably in a tightly closed metal bin. 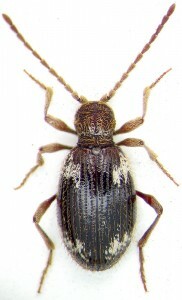 Pests such as drugstore beetles are often introduced in bags of pet food and can readily spread. 10. Prior to purchase, be aware that decorative arrangements of dried wheat, Indian corn and other seed-bearing plants are potential sources of pantry pests. Rice weevils and other pests are often brought into homes with such items. 1. The pests which attack stored food in our homes cause major economic losses and hardship worldwide, damaging 50% of foodstuffs in some developing countries. 2. Most pantry pests originated in the tropics and subtropics and have been distributed throughout the world with infested merchandise. 3. Pantry pests are mostly insects and the majority belong to 2 groups: beetles and moths. 4. Many pantry pests are extremely small, often less than 1/10 inch long. 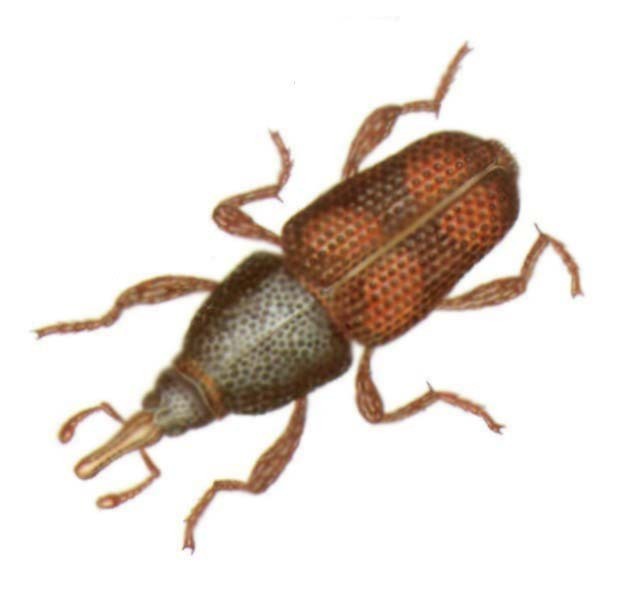 Some, such as the rice weevil, undergo their entire development from egg to adult hidden in a single grain of rice. 5. Huge numbers of pantry pests can breed within stored foodstuffs. 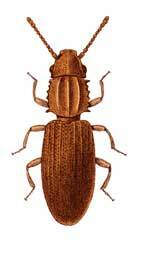 A sack of grain can contain over 40,000 grain weevils, and scientists obtained 250,000 bean weevils from an 87 lb. bag of red kidney beans. 6. Some pantry pests can squeeze through crevices in packaging only 5/1000 inch wide and others readily eat through paper and cardboard packs. Larval drugstore beetles can even eat through tin foil. 7. Many pantry pests can spread from foodstuffs and attack other items. For instance, the drugstore beetle, lesser grain borer and cigarette beetle eat the binding of books, and spider beetles often eat clothing and other textiles. 8. In addition to destroying some foodstuffs, the presence of pantry pests may impart off-flavors which render much more food unpalatable. 9. Consuming food contaminated with insects or fragments of insects can sometimes cause irritation of the digestive tract or allergic reactions. 10. Some pantry pests can spread pathogenic organisms. For instance, flour beetles can carry tapeworms. If you’re interested in the Pantry Bug Pest Control Service offered by Termite Terry please feel free to call us at 949-631-7348 in order to set up an appointment or use our online Order Form and we’ll get back to you as soon as possible.